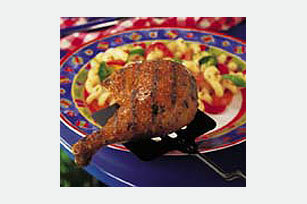 Chicken pieces marinated in prepared Italian salad dressing are grilled to flavorful, juicy perfection. Serve at any summer gathering. Prepare salad dressing as directed on envelope. Pour over chicken in shallow dish or resealable plastic bag; turn over chicken to evenly coat both sides. Cover dish or seal bag. Refrigerate several hours or overnight to marinate. Drain chicken; discard marinade. Preheat greased grill to medium-high heat. Place chicken on grate of grill; cover grill with lid. Grill 35 to 40 min. or until chicken is cooked through, turning occasionally. Serve with grilled vegetables and a whole grain roll. Use marinade over boneless chicken, beef, fish or vegetables. Suggested marinating times: Chicken (boneless) - 1 hour to overnight; Beef - 4 hours to overnight; Fish or Vegetables - 30 minutes to 1 hour. For food safety reasons, do not marinate meat and vegetables together. Always discard dressing after marinating any kind of meat, chicken or fish. Italian Marinade: Mix 1 envelope GOOD SEASONS Italian Dressing Mix, 1/3 cup oil, 1/3 cup dry white wine and 2 Tbsp. lemon juice. Citrus Marinade: Mix 1 envelope GOOD SEASONS Italian Dressing Mix, 1/3 cup oil and 1/3 cup orange juice.